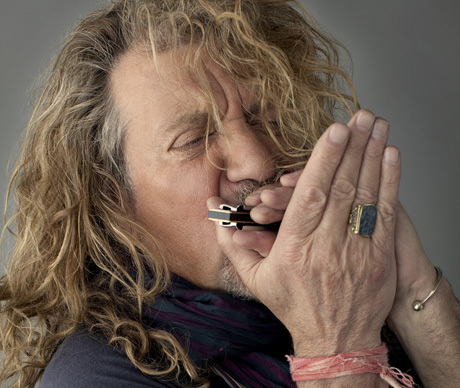 Few rockers of his generation have managed to cling onto their credibility, but Robert Plant has kept his career vital with acclaimed recent albums like Raising Sand and Band of Joy. Now, the former Led Zeppelin wailer is set to receive his own BBC documentary, Robert Plant: By Myself. While Led Zeppelin have been endlessly examined and anthologized, this documentary will aim for a different niche, examining Pant's early life and solo career, in addition to his time with Zeppelin. This includes his stint with the R&B-based Honeydrippers, as well as his latest work with bluegrass singer Alison Krauss and the group Band of Joy. The documentary will air on BBC Two this Saturday (November 6), so this would be a good time to call up a friend with satellite TV. If you can't watch it, the BBC is streaming a full Robert Plant concert here, which will have to tide you over until the documentary is syndicated in your region or until you find it streaming somewhere online. If you want to brush up on some of the events that will be covered in the documentary, be sure to check out our recent Robert Plant Timeline. Robert Plant "Bones of Saints"